I was knocking myself out to get us to the Pennsylvania Farm Show this year. It's one of the few things we try to do as a family every year and we truly enjoy it. It snuck up on us in early January as it always does, and this year, the timing was as uncooperative as a surly child. I felt like a champ when we zeroed in on the one day we could manage to do this, lined up pet care, packed the snacks and headed off under the threat of sleet. Our driveway was still suffering the effects of the blizzard and was a lane of frozen snow and patches of thick ice. Our ritual of pulling out on to the road, in which one person stands at the edge of it and gives the all clear signal was the last obstacle to getting our trip underway. We enjoyed a fairly uneventful ride until the sleet set in, the ice congealed on the windshield, but the road remained drivable. We were on the PA turnpike coming up on the Harrisburg interchange when I lost control of our modest sedan. It spun and twisted like a hockey puck across four lanes of the highway. I watched a hubcap roll off as I desperately tried to regain control of our car which was threatening to hit a concrete divider. Sigh. Didn't we just replace that hubcap? The car unpredictably spun off in another direction and we careened toward a guardrail. I remember thinking, if that guardrail gives way, we will sail down a steep wooded embankment and all die. This could be the end. Maybe I worked a little too hard to make this day happen. So goes that which goes very well. My heart gave thanks as we bounced off the guardrail and landed back in the middle of the wide road where we finally stopped. Traffic was light, so no other vehicles were around to be involved in our "spectacular on ice". I restarted the car, and we hobbled off the exit into a nearby parking lot to examine the damage. At this point, with all of us being uninjured and no other cars being involved in the collision, my cup of miracles runneth over. In the parking lot, we discovered the passenger door wouldn't open. The Mister used an old blanket to get down on the ground and check under the vehicle. We were thankful that the car was sound, drivable, but with significant damage. Even with a crushed front fender and grill, both headlights worked, and so we decided to travel on to the fair. In what would be the true final obstacle in our travels, we discovered we had been locked in the parking lot. It was a gated lot and the gate had been open when we entered and then shut behind us. Someone must have exited through the gate just moments before we pulled in. We tried in vain to summon someone from the government building to whom the lot belonged who could help get us out but could not find anyone who had access to open the gate. We found a back road and were soon on our way. We arrived safely and had a really memorable day at the show. We were alive, unhurt, and our vehicle was completely drivable with mostly cosmetic issues. It was a sweeter day than usual. I will never forget the day we spent together in which I continuously praised the Lord for His protection. I'll never forget caring so little about a car and so much about our family. I'll need to keep remembering those things as we consider the significant cost of fixing the car. Maple syrup always has a prominent exhibit at the farm show. The Mister who is also a part-time tree farmer loves maple syrup. He often buys a half gallon at the show. I think January's deep winter is a good time of year for the rich sweetness of real maple syrup, especially combined with a cold weather comfort like oatmeal. 1 1/2 Tbs. boiling water. Cream butter, sugar, and egg in a mixing bowl. Sift flour, salt, and baking powder into a separate bowl. Add to the creamed mixture. Stir in oats. Mix well. In a separate dish, combine baking soda and boiling water, then add to the dough mixture. Mix well. Chill the dough for at least one hour. Drop the cookies by the teaspoon two inches apart on to a baking sheet. Bake for 7 minutes and cool completely on a wire rack. Mix all the filling ingredients together. I mixed it by hand with a bowl and spoon, but a mixer would work fine too. Use the milk only if needed to blend the ingredients into a spreadable consistency. Spread filling between two cookies. God was really watching over your family. It is a true miracle that there was little traffic and no one was hurt. I am so glad you are alright. Thanks, Linda. It could have gone so much worse in so many ways. I truly felt His grace! Oh, my gosh!! My heart was pounding all through the reading of the scary part of this! That must have been SO frightening! I am so thankful you all are safe and unhurt! Your whoopie cookies look delicious! I LOVE maple! We just had Dr. B's pumpkin whoopie pies at Christmastime. Daughter-in-law C made them, and they were pronounced, "mouth-meltingly delicious - a perfect 10, seriously!!" by son-in-law A! And he was absolutely correct! So I would totally be up for more whoopie pies right now! 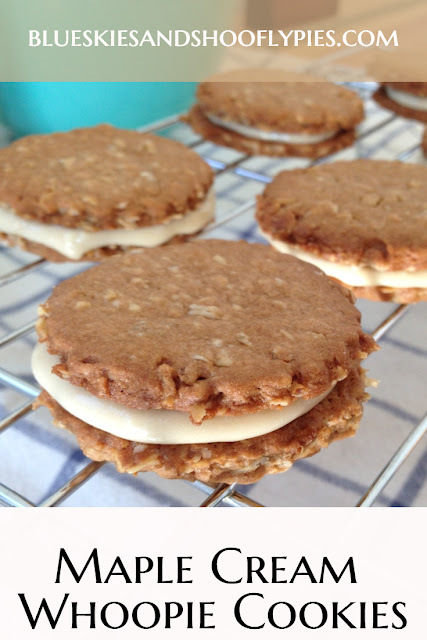 I also see you have a Pecan Pumpkin Gingerbread Whoopie Pies recipe in your blog archives! I don't know how I missed saving that recipe before, but I'm going after it right now! It has me drooling also with all of those wonderful flavors!! Once again though, I am so thankful you all are safe!! Love you guys!! It was very scary and I was still shaken when we arrived. It was truly something I will never forget. Pumpkin whoopie pies are one of my favorite flavors! I haven't made them in a few years but they even beat out chocolate for me. But I must say, the Pecan Pumpkin Gingerbread whoopie pies are truly something else and probably one of the best things I ever baked. They were a special holiday dessert for Christmas 2016. Thanks for the love! I'm so glad to be here to love you back! My GOODNESS! You had me holding my breath. Scary and familiar...so glad you are all fine! You don't soon forget moments like those. Thanks Peggy, I would love for you and Bill to be able to go and am sure you would have a great time. Monica that's just too scary! I'm thankful to the Lord for keeping you all safe!. I thought I left a comment here some time ago. I probably didn’t click publish? Well, I was happy to hear that no one was hurt. That was Farm Show weather! I love the Farm Show, though, and I’m sure you all enjoyed it once you got there.